The Inka Empire (1438–1533) had its own spoken language, Quechua, which is spoken today by about 10 million people including a third of the Peruvian population. 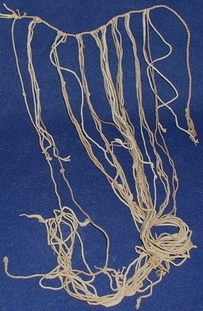 It is believed that the only “written” language of the Inka Empire is a system of different knots tied in ropes that are attached to a longer cord. 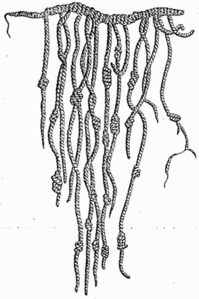 This system is called khipu or quipu. The ropes also have different colors, ply, and attachments, providing additional mechanics for encoding information. There is evidence from the Spanish crusades that khipus encoded census data as well as stories. However, no one knows how to decode either kind of information. There are several hundred khipus in the world today, waiting to be read. Our research group is trying to break the khipu code: how did the Inkas record language with knots in rope? By combining computation, informatics, mathematics, linguistics, and anthropology, we hope to uncover the khipu mystery. In January 2007, we ran an IAP class on Knot Language: Recreating Inca Quipu/Khipu, from which this research group was formed. Videos of some of the lectures will be available here soon. Samuel Blank mathematics Northeastern U. We maintain a password-protected wiki for sharing information within the group.